I've been lurking around the forums before purchasing my C class which i got last week. I love how you guys were able to install the kenwood reverse camera with the default screen on the w204. I've used the same camera on my previous car and can say that the picture quality and coverage is among the best i've seen. Now my question is have anyone of you been able to open or access the new command online unit on the face lifted 2012 C class? I want to attempt the rear camera installation, but the only thing stopping me now is how to access the command unit to inject the camera input. Any help will be greatly welcomed. I know nothing about 2012. 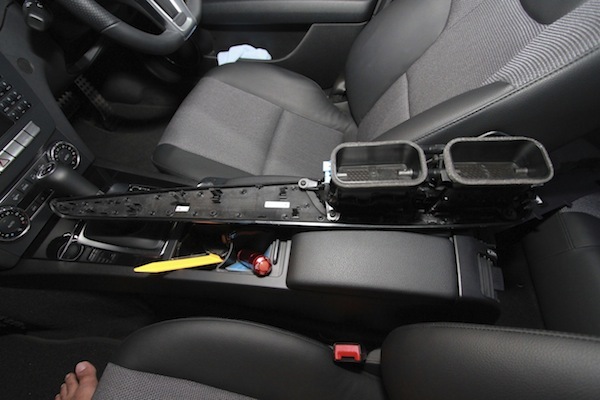 Assume the head unit is the same in terms of assembly, you can use some prying tool, insert the tool in the gap between the center vent assembly and the dash, gentally pry it out. I was afraid of breaking it but it was not that easy to break. Rest is much easier. 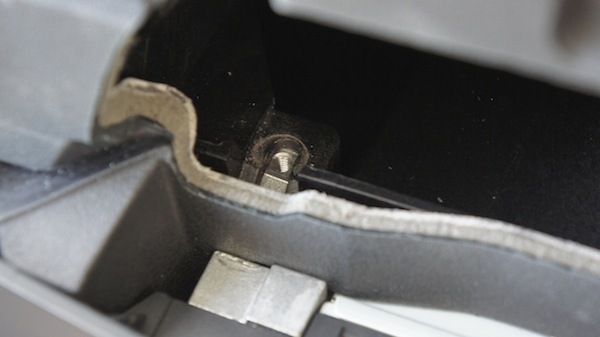 Only two easy-to-find screws to be removed, and right behind those screws there are two locking thing to pull straight up to unlock the head unit. Again, that's the 2011 or earier years. Best way is to ask nice dealer. Last edited by Kaewen; 09-15-2011 at 07:45 AM. I think this mod not for DIY, leave it for professional guy. I'm going to start tinkering as soon as I get that adapter. If you're looking to do it the easy way you could just get a license plate frame with camera built in, but I think the stock camera location looks much cleaner. 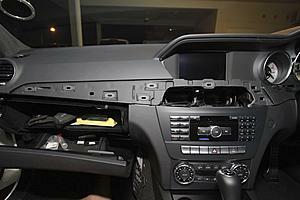 it shouldnt be that hard, just remove the headunit but i think thats a bit diff in the 2012 since its all integrated. 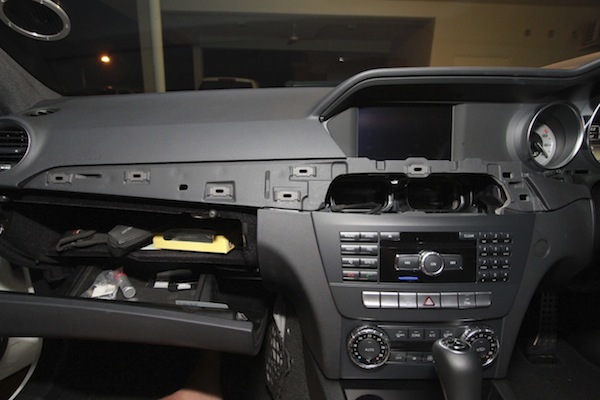 ok.. i've started removing the panels to access the head unit. Seems pretty easy. will post some pictures up tomorrow. 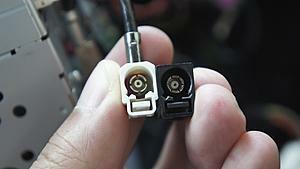 Also i've just received my RCA to FAKRA adapter cable from ebay for USD10. OK guys.. i've finally found some time to post up this little DIY. I've been searching everywhere for a DIY on the new 2012 models, but no one seems to have them. Here you see an overview of all the holes there is. There are 2 hiding on the right side of the air vent. Now you will see 2 torx screws on the inside. One on the left and one on the right. 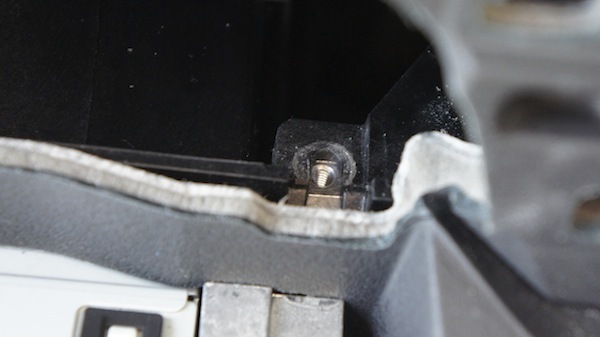 The picture here shows the screws have been removed. Once you remove the screws, you need to take a screwdriver and push down on the screw thread. A little force is required. With that done, the Comand Unit can be removed just by pulling it towards you. I've ordered a FAKRA connector, but it seems i got a wrong one.. Here is where i need your help.. I couldn't figure out which is for the reverse camera??? Thank you TONS for this. Looks like this is the easiest HU to remove yet. Last edited by acr2001; 10-06-2011 at 01:14 PM. Update... i've found the reverse camera input. 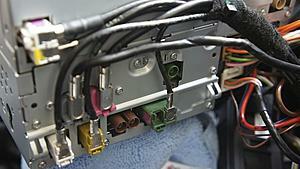 Notice the twin GREEN plug with only one cable? The reverse camera input goes in the other empty slot. I've removed my old terminal from the black fakra cable and just plugged that into the existing free slot in the green twin connector. Hope that is clear enough. If you guys need more help, feel free to PM me. I'm getting my camera today. I was testing the video input with my iPod on the video output. I'm pretty sure you have to rill the holes on the plastic part where the license plate lights are. There are some nice install pics from other members in this forum on their camera installation. I'll probably not be posting mine as it will be the same as the others. Any updates on this? Getting my C250 soon and was wondering if it would be "OK" to take a model without backup camera if I want one, hoping I can easily do this in the future. Two quick questions, is this even necessary? I know in the pre-facelift w204 many of the cars had the reverse camera cable pre-wired to the trunk, is this not the case anymore? Also, since the non-comand screen is just as large as the comand screen (if it isn't, it isn't noticeable to me) can the backup camera also be installed on a non-comand (no navigation) car? Not sure about pre-wiring, that would be nice. The non-comand screen is 2" smaller unless MB listed it wrong as I haven't seen it in person - would love to see a pic of the difference. I would think it does have a video input, but you are going to have to pull it and find out as I haven't seen anyone post here with a 2012 model without comand yet. I'm still hesitating to do my camera install because I'm worried about the fitment of the camera (cutting plastic) on a leased vehicle and can't convince myself to go with a license plate camera as its too ugly. Thanks for the quick response. My cars are always leased. While some people find it stupid to do. I enjoy always having a new vehicle, under warranty, as long as I get a "good deal". It seems that in order to get the good deals, you have to work with whatever they have on the lot (or ones they can locate) and not many come with the rear-view camera - which is ashame. I haven't yet seen a non-command screen in person, but judging from pictures, it doesn't look much different. And one thing is for sure, is that the screen on the non-command in the 2012 is MUCH better than the pre-facelift w204 dinky cheap one. 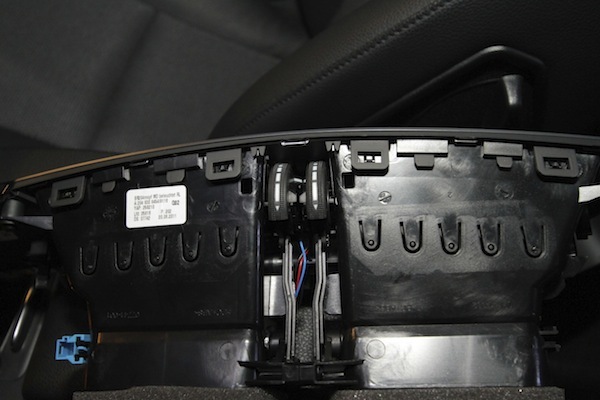 We should really try to find out about pre-wiring, as this would save a ton of time and effort and would take less than 15 minutes to install the back-up camera. However, I don't know what you mean about cutting to mount. The pre-facelift comes with pre-cut "circles" that have caps (just near the license plate lights). I would imagine that the 2012's have something similar. Can you see recessed circles or square outlines? You should be able to pop them out to secure the back-up camera. Unless they have changed things and it is a single piece of plastic (which I hope not). hi.. with regards to wiring, it's not that hard.. i just run on the bottom in between the rubber seals. They are pretty easy to remove and put back.. and it hides the cables snugly. the only thing hard to remove is the kick plate... or door sill.. whatever you call it.. takes a great deal of force to open it up. You do see a cut out square, but you'd require a bit of drilling and ******* to get the hole open. Its a single piece of plastic, so no easy way out there. Here is the picture of my Command Online Screen.. I know in the pre-facelift w204 many of the cars had the reverse camera cable pre-wired to the trunk, is this not the case anymore? My 2011 is not camera cable pre-wired. I doubt MB does anything pre-wired. Maybe people are talking about the video cable you can use in the glove box. 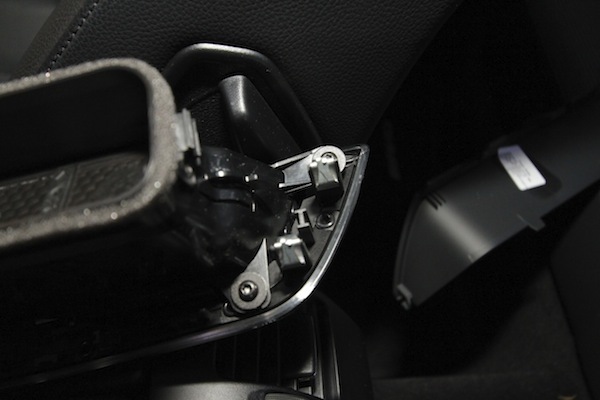 The 'cap' is the same on the 2012 but it is still one piece and will have to be either drilled out or carefully cut out with a dremel so it can be glued back in later if the dealer isn't happy with the lease return including the camera. Mercedes has been known to prewire quite a few things in the past, at great expense. Ex: phone systems before they became standard. Also CD changers and Sirius. Which model kenwood is that? CMOS-200? When you installed the camera did it fit into the pre-cut square or did you have to cut further than that? Once you cut that square out, did you have to cut the mount behind it or were you able to screw right into that mount? The wiring for anyone wondering is a joke - just run the video feed to the back of the head unit w/ a fakra adapter and plug it in. For the electrical, buy an "add-a-fuse" type device and wire into the rear SAM fuse box - into an empty (switched) accessory fuse. Wire the reverse sense wire directly into the same place - this way the camera is on whenever the car is on - it eliminates a lot of problems and is just fine to do. My previous Kenwood cam worked for many flawless years that way. Last edited by acr2001; 12-26-2011 at 12:57 PM. 1. Yup.. i used the CMOS200. You get to see everything and it has a pretty nice wide angle coverage. As the camera is placed on the side and not in the center, you tend to get to see a bit of your boot anyways.